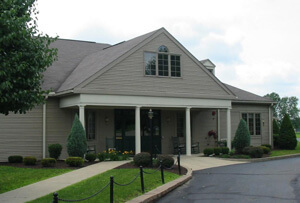 Windsorwood Place Assisted Living has been proudly serving the Coshocton area since 1994. Abbington acquired the community in 2003 and has continued its tradition of outstanding service and quality care in Coshocton. Windsorwood Place is a beautiful, single-story community consisting of 50 residential apartments, abundant common area amenities, an interior courtyard, and walking paths. The community is located on the corner of Brown’s Lane and 2nd Street, adjacent to the Coshocton County Senior Center. Numerous dining and shopping establishments are located nearby. You will experience and appreciate the comfortable, friendly atmosphere. Please contact us or call Stacy Guilliams, Executive Director, at (740) 623-4600 for a personal tour at your convenience. At Windsorwood Place, an Abbington Assisted Living Community, we value the independence of our residents. No one wants to feel like a burden to their family. It adds stress for everyone. At our assisted living communities, the residents don’t depend on their children for everything. Instead of worrying about eating habits, medication, and housekeeping, visits can be relaxing, happy. When residents have their family visit we want everyone to be stress free. That’s what assisted living is all about. Now life can be enjoyed. Windsorwood Place really feels like home. Fellow residents become friendly neighbors. Cozy fireplaces and parlors give character to the surroundings. And the private rooms have enough space for personal touches. It’s not a hotel or a hospital. The room becomes your own. Pictures and decorations are encouraged. It’s not just a place to live, it’s home. As I think about my experience here at Abbington of Pickerington all I can say is “Thank you!” There are staff members here that have been instrumental in my stay. Leaving my home has been really hard and some days I miss it a great deal and have had to rely on the wonderful memories that my family and I shared there. The little things like staff stopping by for a quick visits, receiving a wonderful shower, staff being proactive with the tasks I need help with and even catching my cat when she got out of my room are just a few examples of what I have grown to enjoy. I know Abbington was a great choice! On the second day here I said to one of my friends, “This is home!” and that was 1 ½ years ago. Reading in the newspapers about abuse, thefts, or bad care given to people in nursing homes and yes, even in assisted living can scare a person. Here at Abbington you do not have any of this.From the administrator, nurses, aides, cooks, or housekeepers, It is entirely the opposite… And it’s wonderful that even people on Medicaid can live here. I know this a wonderful home as I personally worked in 2 homes in the past. This is my home! I have been very pleased with this organization. Everyone is very pleasant, understanding as well as willing to help the residents. The buildings are very well set up for people to get around comfortably even with wheelchairs or walkers. Mom says they treat her like a queen! The staff has been great and that has made the transition go very well. They’ve made everything so much easier overall. The transition has been great! She loves the facility and people here. The staff made Terry feel welcome and helped to acclimate her to her new environment and routine! The transition went better than I could have imagined. She’s eating very well, which is a big change. She interacts a lot with friends and participates in activities.